I never did get Darryl Sharpton at an event for the Texans after he cancelled on the Battle Stampede Tour back in 2012. Such a shame. He had some really nice base cards. In the meantime I went ahead and picked up this Bowman Sterling. It’s not bad looking, but the framing device takes up half the card. For all intents and purposes Sharpton could be an offensive lineman in that shot. His hands are also noticeably not present, which makes less of an impact statement. At 5’11” 235, Sharpton was a bit undersized to be playing linebacker but had made up for it with a solid Senior season playing for the Miami Hurricanes. He racked up 106 tackles, and had an interception and fumble return for touchdowns in 2009, earning second team All-ACC Honors. Darryl was also praised for his ability to play all three positions in the 4-3, solid tackling, and for his great motor against the run. 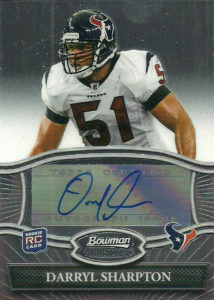 The Texans felt that he fit something that they were looking for, and selected him in the 4th round of the 2010 draft. He started 6 games and recorded 13 tackles and a sack his rookie season. The team looking to go in a different direction from Frank Bush, brought in Wade Philips to coach the defense in 2011. He converted the defense to a 3-4 alignment, drafted Brooks Reed, and moved Mario Williams to outside linebacker. Sharpton had a hard time finding the field, but in 2013 had his best season for the team starting 8 games and recording 55 tackles and 2 forced fumbles. The Texans opted not to resign Darryl, and he signed as a free agent with the Washington Redskins in 2014. Sharpton was placed on injured reserve before the end of training camp and was released. He later started 2 games for the Bears and made 10 tackles. Darryl signed with the Cardinals in 2015, but confident in their young LB corps, he was cut before they even hit training camp. As of 2016, Darryl is currently a free agent.